This retrospective study included a total of 242 patients with ESRD on regular hemodialysis (HD) at Gezira Hospital for Renal Diseases and Surgery, Sudan, and was done in the period from 1 January to 31 December 2008. Medical records of all patients were studied. All our patients received two sessions of HD per week, and each session was for 4 hours. SPSS was used to analyze the results. Two hundred forty-two patients were included in this study. The whole study group results revealed that 66.52% (161) were males and 33.47% (81) were females. The mean age was 44.08 (SD 16.36) years and the mean HD duration was 30.29 (SD 25.56) months. Mortality rate per 1-year was found to be 7.44% (18). The mean age for the mortality group and the survival group was found to be 50.44 (SD 14.17) and 43.95 (SD 16.36) years, respectively, and the mean duration of HD for the mortality group and the survival group was found to be 21.94 (SD 18.26) and 30.30 (SD 25.65) months, respectively. In the mortality group, 50% (9) were males and 50% (9) were fe-males, while in the survival group, 67.85% (152) were males and 32.14% (72) were females. [Figure 1] shows the causes of death. Figure 1: Causes of death. Although all our patients were receiving only two sessions of HD per week (8 hours per week), our study reveals a mortality rate of 7.44% per year, while the mortality rate was reported to be 6.6% in Japan, 15.6% in Europe, and 21.7% in the US. The mean age of 50.44 years in our group is less than the mean age reported in the HD patients from the US, Europe and Japan where it is 60.5, 60.2 and 58.6 years, respectively,  but more than the mean age group reported from Libya and Saudi Arabia. , Bloembergen et al reported that males had a 22% higher risk of death than females,  but we found no difference between male and female mortality and cardiovascular disease accounts for approximately 50% of deaths. While a decline in cardiovascular deaths has occurred in the general population, a similar trend has not been observed in dialysis patients. In our study, deaths due to acute myocardial infarction and cerebral vascular accident represent 5% and 17%, respectively. 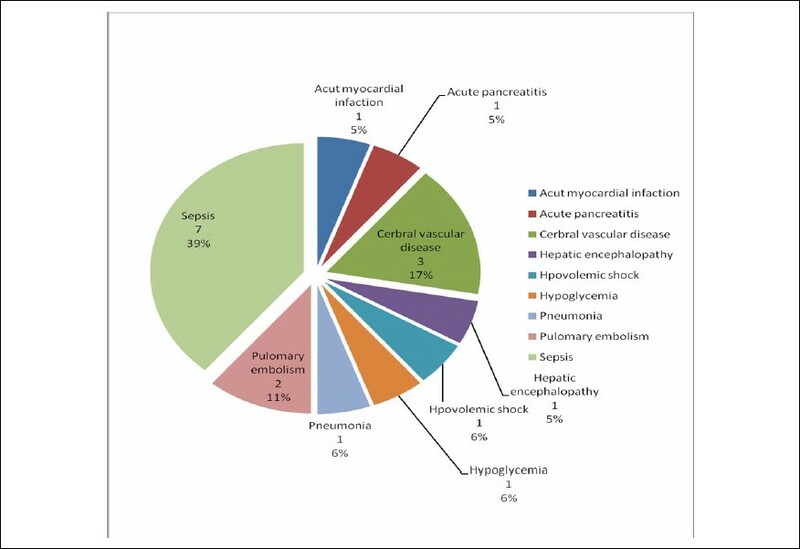 The leading cause of death in our study is infection (45%), while other centers reported it to be second cause of death. 1. Reikes ST. Trends in end-stage renal disease. Epidemiology, morbidity and mortality. Postgrad Med 2000;108(1):124-6. 2. Wallen, MD, Radhakrishnan, J, Appel, G, et al. An analysis of cardiac mortality in patients with new-onset end-stage renal disease in New York State. Clin Nephrol 2001;55:101. 3. United States Renal Data System. Excerpts from USRDS 2007 Annual Data Report. U.S. Department of Health and Human Services. The National Institutes of Health, National Institute of Diabetes and Digestive and Kidney Diseases. Am J Kidney Dis 2008;1(Suppl 1):1-320. 6. Jondeby MS, De-Los Santos GG, AlGhamdi AM, et al. Caring for hemodialysis patients in Saudi Arabia: past present and future. Saudi Med J 2001;22(3):199-204. 7. Bloembergen WE, Port FK, Mauger EA, Wolfe RA. Causes of death in dialysis patients: racial and gender differences. J Am Soc Nephrol 1994;5(5):1231-42. Bello, B.T. and Raji, Y.R. and Sanusi, I. and Braimoh, R.W. and Amira, O.C. and Mabayoje, O.M.